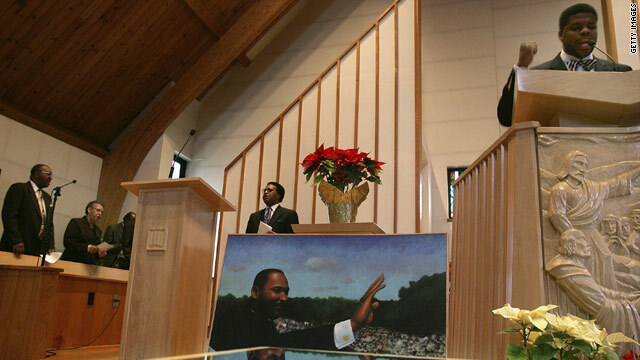 "Lift Every Voice and Sing" is an uplifting spiritual, one that's often heard in churches and popularly recognized as the black national anthem. Timothy Askew grew up with its rhythms, but now the song holds a contentious place in his mind. "I love the song," said Askew, an associate professor of English at Clark Atlanta University, a historically black college. "But it's not the song that is the problem. It's the label of the song as a 'black national anthem' that creates a lot of confusion and tension." The song and its message of struggle and hope have long been attached to the African-American community. It lives on as a religious hymn for several protestant and African-American denominations and was quoted by the Rev. Joseph E. Lowery at Barack Obama's presidential inauguration. After studying the music and lyrics of the song and its history for more than two decades, Askew decided the song was intentionally written with no specific reference to any race or ethnicity. Askew explains his position in the new book, "Cultural Hegemony and African American Patriotism: An Analysis of the Song, 'Lift Every Voice and Sing,'" which was released by Linus Publications in June. The book explores the literary and musical traditions of the song, but also says that a national anthem for African-Americans can be construed as racially separatist and divisive. "To sing the 'black national anthem' suggests that black people are separatist and want to have their own nation," Askew said. "This means that everything Martin Luther King Jr. believed about being one nation gets thrown out the window." Why is it always those of the African Diaspora who have to sacrifice our heritage in order to make others feel 'comfortable?' Instead of speaking on the Black National Anthem's so called separatism, the professor would have been better served trying to enlighten the masses about the history of the song and the pain and struggle through which it was birthed and what made such a song necessary. So often we choose to disavow our heritage without taking into consideration the history of our struggle. We, as a people, are more ashamed of our history in America, then any other race. We constantly produced black apologists who instead of speaking to the suffering of our ancestors would rather re-write things in order to lessen the sting for the oppressor than enlighten the oppressed. We do our children a disservice when we choose to re-write our history instead or just teaching them our history which is in fact American History. Lift Every Voice and Sing speaks to the resilience of our people, who in spite of all the obstacles of bigotry and racism, still managed to sang songs of praise. To endure all they had to endure and still be able to sang is a testament that we should be proud of. Just read the lyrics and tell me if you don't feel a sense of pride. I really don't see this point of view as apologetic or a denial of history. I also don't believe that the song was meant to be separatist. Who decided that it would be the "Black National Anthem," I couldn't tell you. I'm not crazy about alot of labels. From a historical perspective, I understand why some things have been named and labeled what they have. For history's sake, I believe those labels should remain in place. At the same time, I can see how certain names/labels perpetuates a separatist view. And we know that separate is not equal. Thus the black experience in America will never be viewed as an American experience.